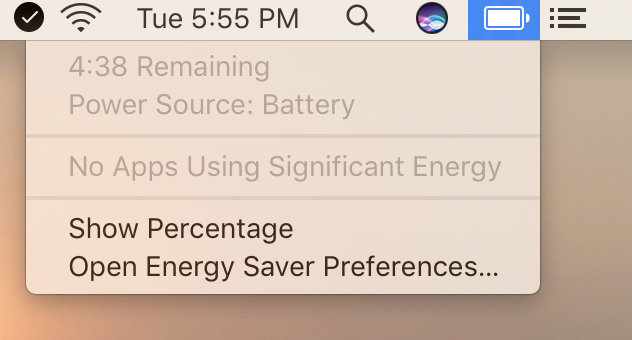 My 15-inch 2016 MacBook Pro with Touch Bar is pretty good in most ways, but it’s a noticeable regression in battery life from the previous generation. Apple claims it lasts 10 hours, but I’ve never gotten that — in a fairly light web-productivity workload, I average around 5–7 hours, and if I’m using Xcode, I’m lucky to get 4–5 hours. This seems common — many other customers and reviewers have noted similarly disappointing battery life in the 5-hour range. Apple issued a software update today to address this. You can still see the image on the top of the screen, and you can see the percentage, but you will no longer be able to see how much time is remaining before your battery dies. The reason for removing it is very simple: it wasn’t accurate. Apple said the percentage is accurate, but because of the dynamic ways we use the computer, the time remaining indicator couldn’t accurately keep up with what users were doing. Everything we do on the MacBook affects battery life in different ways and not having an accurate indicator is confusing. Well, I’ve always found the time-remaining indicator pretty accurate. Just last night, I brought my 100%-charged laptop to the couch to order some nuts and browse the web for a while, and it reported about 5 hours remaining. After just over an hour, the battery was down to 77%, and it estimated that I had about 4 hours remaining. I found it equally helpful when using Xcode normally at the start of a 5-hour flight, as it told me that I had about 4 hours of battery left. I ran it down to 8% before stopping — with about 30 minutes left in the flight — and it remained accurate the whole time. Apparently, that’s all wrong, and my laptop really would’ve lasted for that full flight had I just let it discharge past 8%.